Unsurprisingly, one of the first things you do in South Park: The Fractured But Whole is a pooping minigame, matching the on screen prompts to become a Deuce Master. 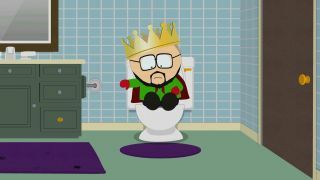 If you want to unlock the Crappin' Forte trophy or achievement, you'll need to track down all 21 toilets located across South Park and achieve the highest master level for them all by correctly completing each minigame - you'll know you've done this when a green tick appears over the toilet icon. You can complete this collection at any point during or after finishing the story, though you won't be able to access the last few until you've unlocked the Sandblaster and Haywire buddy powers. Read on, to discover the location of every porcelain throne in the game. The first thing you'll do in the game, in your house. Upstairs in Cartman's House, last door on the left. Upstairs in Butters' House, first door on the right. Upstairs in Kyle's House, last door on the left. Upstairs in Jimmy's House, last door on the left. Upstairs in Henrietta's House, last door on the left. Upstairs in Craig's House, last door on the left. Upstairs in Clyde's House, last door on the left. Upstairs in Bebe's House, last door on the left. At the back of Park County Police Station, enter the Men's Bathroom from the Break Room. Punch through the wall in the Policemen's Toilet stall to reach the Women's Bathroom, then use the left-hand stall. Now use the right-hand stall. At the back of Freeman's Tacos, enter the bathroom. Along the back corridor in Big Gay Al's House, last door on the left. Upstairs in Nichole's House, last door on the left. Outside the South Park Mall construction site. Inside the Peppermint Hippo, first accessed when you break in during a story mission. At the back of the Community Center, enter the Women's Bathroom - move the bin then break the wall and use the Sandblaster buddy power to clear the toilet, before taking a selfie with Mr. Hankey to access it. At the back of the Community Center, enter the Men's Bathroom - use the Pause TimeFart ability to cross the electrified water and turn off the switch, so you can access the toilet. Upstairs in Kevin Stoley's House, last door on the left - use the Haywire buddy power to open the garage door, then climb the ladders to get inside through the upstairs window. Upstairs in Stan's House, last door on the left - break the wall and use the Sandblaster power ability to clear the toilet, then take a selfie with Mrs. Hankey to access it. Congratulations - you've mastered every toilet in South Park: The Fractured But Whole and unlocked the Crappin' Forte trophy or achievement.